Since moving away from the Bay Area, I definitely miss my pisco-based cocktails. Every fancy cocktail spot there seems to have at least one variation, and they were some of my favorites. 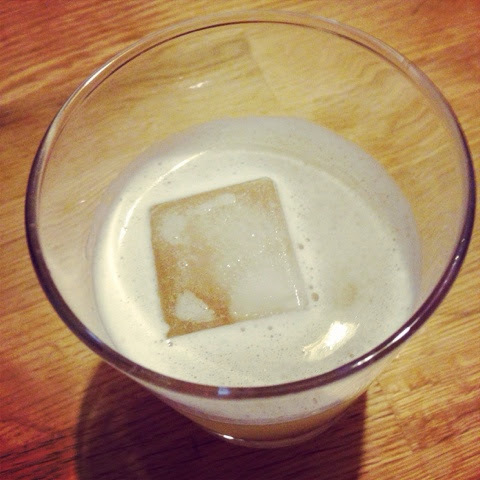 Luckily, I've learned how to make a couple of these cocktails at home, which is a lot of fun! My previous forays into cocktail-making have involved simple stir-and-serve drinks like gin-and-tonics or white Russians...tasty, but not particularly fancy. This drink involves a fancy pants pineapple syrup and gets shaken up in a cocktail shaker until it's foamy on top, so it definitely makes me feel like I'm upping my game! Plus, it's super delicious, and not too sweet (despite what the name might have you believe). Best of all, it takes me back to San Francisco in a glass. Combine the ingredients in a cocktail shaker with ice. Shake well, and strain into a cocktail glass. Add a cube or two of ice, and enjoy. This is one of those meals that is just supremely satisfying. 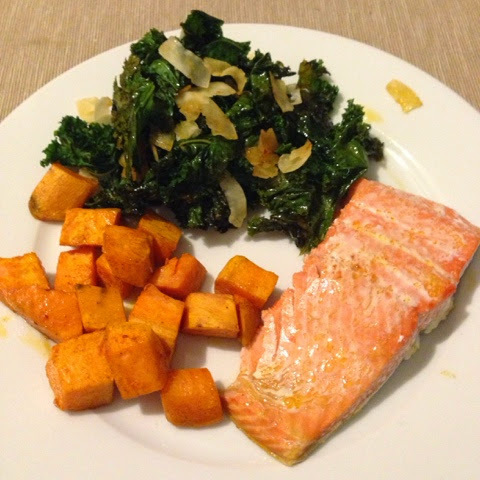 The salmon is tender and tasty, the sweet potatoes are perfectly spiced, but the roasted coconut kale is really the star of the plate. Some of the pieces end up a little crispy, like kale chips, while others are tender and juicy. This is definitely my new favorite way to enjoy kale, since you get the best of both worlds! The flavors are also excellent, with a little kick from chile-garlic sauce (add more or use Sriracha if you like your food spicy) and just the right amount of sweetness from toasted coconut and coconut oil. Yum! One word of warning: I though the leftovers were only so-so, and so I'd recommend making just the amount you plan to eat right away. 1. Preheat the oven to 400 degrees and line two large baking sheets with foil. 2. Whisk together the coconut oil, soy sauce, chile garlic paste, and sesame oil. Set aside. 3. Toss the sweet potatoes with a bit more coconut oil, as well as the smoked paprika and a generous pinch of salt. Arrange in a single layer on one of the baking sheets, and pop in the oven. Set a timer for 15 minutes. 4. Place the salmon on a plate and drizzle with 2 T of the coconut-chile dressing. Set aside. 6. Once the potatoes have cooked for 15 minutes, stir with a rubber spatula and move them to one side of their baking sheet (still in a single layer). Add the salmon fillets to the now-empty side, and pop back in the oven, along with the kale. 7. Roast for an additional 15 minutes, until the sweet potatoes are tender, the salmon is cooked through, and the kale is tender and starting to brown in places. Yum! We don't often buy steak for dinner, so when we do it's gotta be good. This recipe definitely fits the bill, with a sweet-savory marinade and ultra-tender meat. Despite a whole cup of coffee, I didn't actually think the finished dish had too much of a coffee flavor -- the balsamic and Dijon mustard were definitely stronger. You might try using espresso if you have it available. Either way, the steak was super tasty and perfect alongside roasted carrots and fresh bread from the farmer's market. If you have any leftovers, the steak is awesome in a gourmet breakfast sandwich with egg and cheddar on an English muffin. 1. Whisk together the shallot, garlic, coffee, balsamic vinegar, mustard, brown sugar, olive oil, and pepper in a large bowl. Pour 1/2 cup of the mixture into a small bowl and set aside. 3. Heat a grill pan or large skillet (I used two skillets) over medium high heat. When hot, add the steak and discard the marinade it was in. Season with kosher salt and cook about 8 minutes total, turning often. When you turn the steak, brush with the reserved marinade. 4. Let rest 10 minutes before slicing and serving. 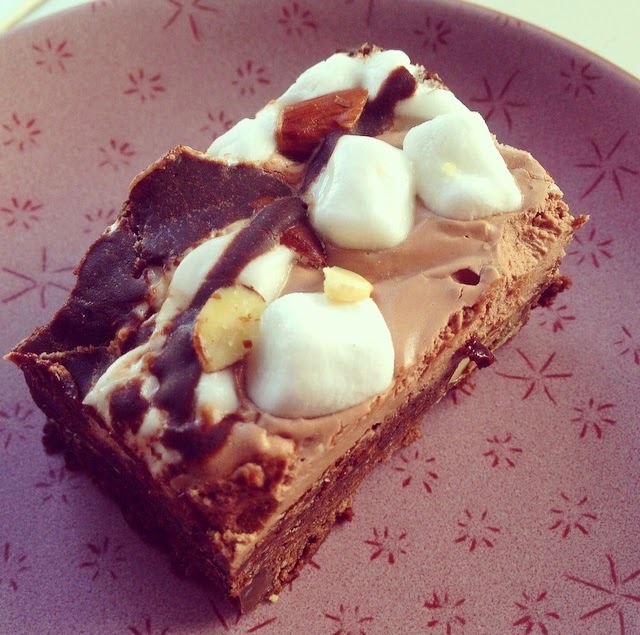 I was recently sent a copy of the new cookbook Extreme Brownies to review. With a title like that, who could refuse? This is one of those cookbooks that is just lots of fun to page through, with beautiful photos and creative flavor combinations. I couldn't decide what to make first, so my fiance chose this recipe to test out. Despite the name, there is no pot in these brownies...they're named after the ice cream of the same name (i.e. chocolate ice cream with marshmallows, almonds, and chocolate chips). The verdict: These brownies are a lot of work, but they are so delicious...definitely more exciting than brownies from a mix! They start off with an ultra-rich layer of brownies full of chocolate chips and crunchy almonds. The brownies are topped with a marshmallow-chocolate nougat, and then mini-marshmallows and more almonds are pressed into the nougat before it cools. A chocolate drizzle is the perfect finishing touch. The finished brownies are a crazy-indulgent dessert. Although the directions say to chill the brownies before cutting into them, I strongly suggest sneaking a square while they are still warm...although it will be messy, you just can't beat gooey, warm brownies! Once the brownies are cool, I recommend freezing half the batch (unless you're making these for a large event). They're rich enough that you'll want to stick to small portions, and at least for our little household of two, a 9x13 pan was way too much to eat in a week. Just slice into small squares and wrap well. Luckily, these treats freeze well and are just as good defrosted at a later date. Pop them in your lunchbox and they'll be good to go at lunch, or microwave for just 10-15 seconds. 1. Preheat the oven to 350 degrees and line a 9x13 pan with foil. Spray with oil. 2. Make the brownies. Cut the almonds in half (or roughly chop), and place in a small bowl with the semisweet chocolate chips. Set aside. 3. Cut the butter into cubes, and place in a saucepan over medium heat. When it starts to melt, add the unsweetened chocolate and the 60% cacao chocolate chips. Whisk until the chocolate is melted and smooth. Remove from the heat and set aside. 4. In a large bowl, whisk the eggs lightly. Add the sugar and salt, and whisk until just incorporated. Briefly mix the melted chocolate mixture, and then whisk into the egg mixture along with the vanilla. 5. Sift the flour and baking powder into the batter, and stir with a rubber spatula until just combined. Gently fold in the almonds and chocolate chips. 6. Scrape the batter into the prepared pan, even out the top, and then bake until a tester comes out clean, about 28 minutes (mine took more like 40 minutes, so test early and often). 7. Once the brownies come out of the oven, start the chocolate nougat. Cut the butter into small pieces, and combine in a saucepan with the sugar and evaporated milk. Cook over medium-low heat until the butter melts and the sugar dissolves, and then turn up the heat and bring to a boil. Reduce heat to a simmer, and simmer without stirring for 5 minutes. Remove from the heat. 8. Off the heat, vigorously (but carefully - the mixture is very hot!) whisk in the marshmallow Fluff. Add the chocolate chips, salt, and vanilla, and again whisk vigorously until smooth. Pour over the brownies and smooth the top quickly with a rubber spatula. 9. Sprinkle the mini marshmallows and almonds over the nougat and gently press on them so that they adhere. 10. Make the chocolate drizzle. Melt the butter and corn syrup in a small saucepan over medium heat. Remove from the heat and stir in the chocolate chips with a rubber spatula, until melted and smooth. Add the water to thin the sauce, and stir again until smooth. Drizzle over the brownies. 11. Let cool about an hour at room temperature. Then either enjoy warm and gooey (and messy), or pop in the fridge overnight for a neater-looking dessert. Full disclosure: I received a complimentary copy of this cookbook for review purposes, but all opinions and recipe testing are my own. I've been making an effort to prep one lunch ahead of time on the weekends for my fiance and I to take to work during the week. This yam-and-eggplant stew was a recent tasty lunch, and I figured I'd make this a semi-regular feature on the blog in case anyone else out there is looking for prep-ahead lunches that are a little more exciting than PB&J. 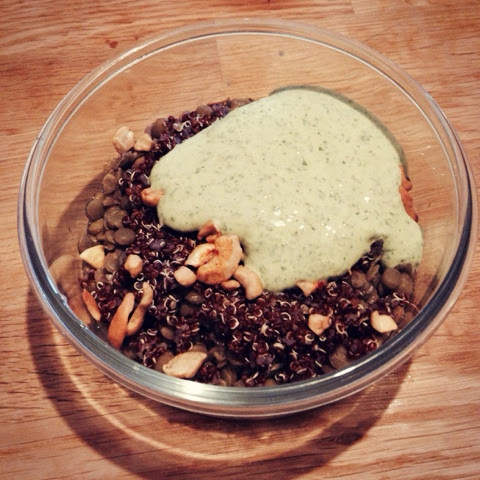 So, next up is this lentil-quinoa "yoga bowl." The base of lentils and quinoa provides protein, cashews add crunch, and a tangy spinach-yogurt sauce makes the dish extra yummy. I'm not going to lie -- after a day or two in the fridge, this is not the prettiest dish in the world. But, give it a chance because the flavors are fantastic! Word of warning: the portion size here is definitely for someone on a diet (or someone with a small appetite). Both of us found it wasn't quite enough to keep us going through the afternoon. To bulk this dish up, you could increase the amount of lentils and/or quinoa; add an additional protein like tofu, grilled chicken, or cooked salmon; or pack a thick slice of whole grain bread on the side. 1. Cook the lentils and quinoa separately according to package directions (essentially, cover with lots of water, bring to a boil, and simmer until tender; time will vary depending on which type of lentils you use). Drain, and place in separate bowls. Season generously with salt. Layer into four lunch containers -- a scoop of lentils followed by a scoop of quinoa. 2. Sprinkle each container with a quarter of the cashews. 3. Gently heat the oil over medium heat in a small pan. Add the paprika, and cook for about 30 seconds, until fragrant. Drizzle evenly over the four containers. 4. While everything cools off, make the sauce. Combine all the sauce ingredients in a blender or food processor, and blend until smooth. Taste and adjust seasoning as needed. Divide among the four bowls. Squeeze lime juice all over the top. 5. Cover and stash in the fridge until ready to eat. Right at lunch time, stir everything together and enjoy. This is a great weeknight pasta dish, because the sauce cooks in the time it takes to bring a pot of water to a boil and cook the pasta. Despite being quick, the dish is flavorful and filling. You can use any combination of roasted and fresh bell pepper you have here -- I had half a jar of roasted red peppers in the fridge, and supplemented with a fresh bell pepper I had on hand. The peppers pair well with creamy goat cheese, both melted into the sauce and sprinkled on top of the finished dish. 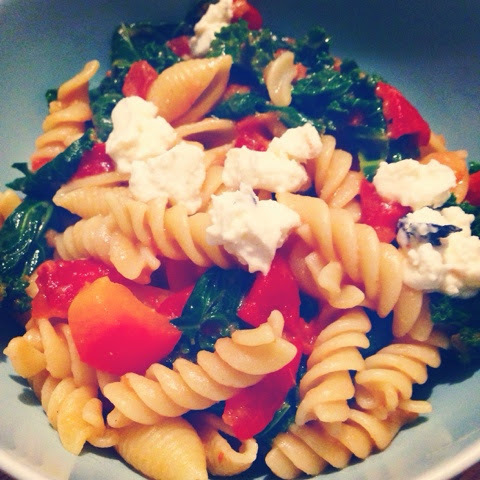 Kale cooks right with the pasta for an easy way to add greens and texture to the dish. Serve with good bread on the side for a hearty, tasty dinner -- we picked up a loaf of this baby spinach, onion, and garlic ciabatta from the farmer's market. 1. Bring a large lot of water to a boil. When it boils, add the pasta along with a generous pinch of salt. When the pasta has 2 minutes to go, add the kale. Drain. 2. While the water comes to a boil and the pasta cooks, make the sauce. Heat a generous pour of oil in a large skillet over medium heat. When it gets hot, add both types of pepper along with the garlic powder, onions, and a generous pinch of salt. Cook for 7-8 minutes, until the peppers are tender. Add the crushed tomatoes, and stir until hot. Then add half the goat cheese and stir until the cheese melts. Then turn the heat down to low and let the sauce bubble until the pasta-kale mixture is ready. 3. Stir together the sauce, pasta, and kale until everything is evenly distributed. Taste and add more salt if needed. Serve topped with the remaining crumbled goat cheese. Salmon was on sale at the grocery, so I picked some up without a clear idea of exactly what I was going to do with it. This sesame-soy glaze was the perfect choice because it was super easy and used items I already had in my fridge and pantry. Bonus: super delicious! 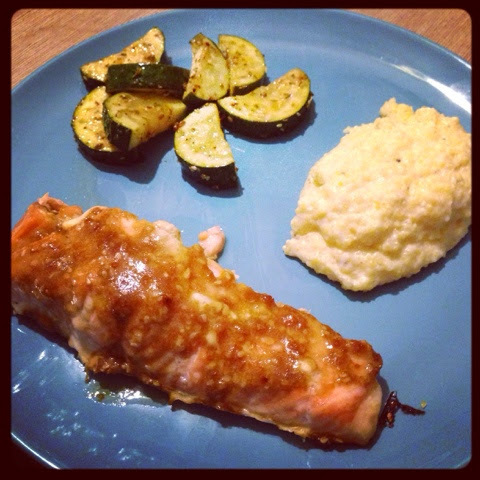 The sauce is sweet but not overly sugary, and I love sesame seeds on pretty much everything. We didn't manage to leave any leftovers, but I bet this would be awesome cold the next day for lunch, maybe on a big salad. 1. Preheat the oven to 350 degrees and line a heavy baking sheet with foil. Grease lightly. 2. Place the salmon skin-side-down on the baking sheet, and score down to the skin (but without cutting through the skin) in a criss-cross pattern, spaced every 2 inches or so. 3. In a medium bowl, whisk together the soy sauce, mustard, sesame seeds, brown sugar, onions, garlic powder, and oilve oil. Pour as evenly as possible over the fish (some will run off). 4. Bake until the salmon is cooked to your liking - 15 minutes or so for smaller/thinner fillets, or 25 minutes for a larger piece of fish.